With unexpected medical bills piling up and his employer suspending its bonus program, Ethan Nicholas and his family faced a financial crisis. So he struck a deal with his wife, Nicole: If she took on more responsibility in caring for their two young boys, he would devote the hours before and after his regular job to building a video game for the Apple iPhone. The 30-year-old computer programmer hoped to sell enough copies of the game that the couple wouldn't have to put their home on the market. That was more than $700,000 ago. 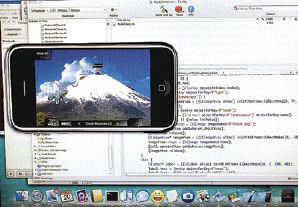 The game Nicholas built, "iShoot," sat atop the most downloaded list in the iPhone application online store for weeks. Phone users couldn't get enough of the game, which features tiny battling tanks and sells for $2.99. "Nobody could, for a little tank game I wrote in six weeks on my couch." An Apple spokeswoman said she could not share sales figures about a specific game, but noted that more than 15,000 different applications have been made available since the App Store's launch in July 2008. They have been downloaded more than 500 million times. Pinch Media, an analytics and market-research company that specializes in smart-phone applications, confirmed that iShoot topped the best-selling app list for more than three weeks. To help goose sales of iShoot, Nicholas released a free version, iShoot Lite. For a few days, iShoot Lite was No. 1 on the free download list, while iShoot topped the paid-download list, said Greg Yardley, CEO of Pinch Media. Because iPhone applications tend to be inexpensive and can be downloaded on the go, users can buy on impulse, Yardley said. And by setting up a store where programmers can sell their wares, Apple has "made it very easy for developers to make money." For every $2.99 game that Nicholas sells, Apple keeps 30 percent. Nicholas gets the rest -- about $2.09 for every game sold. "I am thrilled to give them 30 percent," Nicholas said. "I wouldn't have made a penny without them." Prior to his iShoot coup, Nicholas worked from home as a programmer for Sun Microsystems. On Jan. 6, he made about $2,000 on the iShoot game. On Jan. 11, he gave his two week's notice to Sun. On his best sales day, Nicholas said he sold more than 17,000 copies of the game. He earned about $37,000 before taxes that day, all for a game he designed "holding a bottle in one hand and typing with the other." Nicholas, who graduated from Enloe High School in Raleigh and later dropped out of N.C. State University to start his programming career in earnest, built the game on a laptop while sitting on his living room couch. He wanted to work where he could easily interact with his sons -- Spencer, 3, and Gavin, 19 months. Nicole said she had no hesitation about his taking on the iPhone project. "I really believe in him. I have faith in what he does," she said. For her dedication during the building phase, they used some of the money to buy her a new laptop. Nicholas built iShoot because he's always enjoyed artillery-style games, and a good one hadn't been devised for the iPhone. He's already working on iShoot version 2.0, and has another game in development for the iPhone. He's also started his own company, Naughty Bits software, to concentrate on building iPhone games. The market for iPhone applications is so new, it's difficult to know what the future holds, he said. But he's going to find out, on the couch in the home that his family loves.